It is five years old and never bloomed. Well established, new growth every year, but nary a bloom. What could it be? Trumpet Vine can take up to 10 years to began flowering. If your plant was started from seed, it could take as many as 10 years for it to flower. 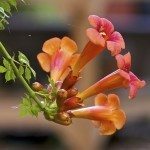 Too much fertilizer, soil that's too rich, too little sun or pruning at the wrong time are all possible reasons for the lack of blooms on your trumpet vine.